Technology is evolving and changing rapidly. And perhaps the way the staff of your small business is working, has been evolving too! The Internet and access to Wifi are changing where work can be done. These factors and other technology are re-shaping the needs of business for traditional office space. Traditionally your workers required special tools and processes, and those tools were at the office workplace. Therefore, in order to work, you staff needed to commute from their home to that workplace. This has all changed, and now many more people are able to work from home and not take up valuable office real estate. According to a 2015 telecommuting statistics report published by GlobalWorkplaceAnalytics.com, the number of regular work-at-home employees has grown by 103% since 2005. Currently, nearly 4 million or 2.5% of workers are doing their jobs from the comforts of home at least half the time. 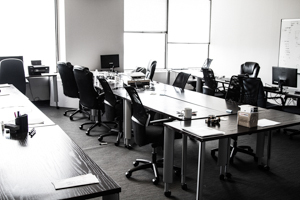 Here are some reasons you might consider to ditch your traditional office space and move into a serviced office space that will, in turn, reduce workplace staff to only essential on-site employees. A big office is not only costly to a company, but also costly to employees who have to commute. The rising costs of renting and maintaining a physical office have been accepted as a given for most companies, but they have not looked at the alternatives. Telecommuting saves money and resources for a company and its employees. Let’s not forget the office ‘time-wasters’ of in-person meetings and office gossip around the water cooler that often happens when all your staff is working from one location. Less office means less distractions, which means more productivity. Not having those other people at the desk next to every employee, means there are less potential distractions from getting work done. You would be surprised to know how much office side-chat can consume a working day. Also consider how much that side-chat consumes every week and year. Work/life balance for work-from-home employees is often healthier – because of the reduced stress of not having to commute or work in a traditional office space. In a recent study of 1,700 employees conducted by SoftChoice, 75% of the employees polled said that remote working allowed them to keep more of their social and personal commitments, leading to better work/life balance. While most companies will never be without office space, the type and amount of office space they take up will change. Many companies are moving to smaller spaces that hold fewer employees that need to be at HQ, but still allow for shared/private coworking space for employees to use when needed. These are spaces mainly for work-from-home employees who need to come into the office on occasion, to work with other team members or meet with clients. There are spaces readily available for them to set up and get work done. Recently, Telsec was approached by a large company that needed some private coworking space for a team that primarily worked from home, but still needed a downtown office space that felt like a coworking space when they needed to work collaboratively. Most of the team members lived downtown or a few minute’ commute to 1 Yonge Street. Therefore, having private, coworking office space at Telsec was an obvious choice.